A few months ago I was sent Chris McGrath's amazing cover artwork for Children of Scarabaeus - I like it even more than the previous one. 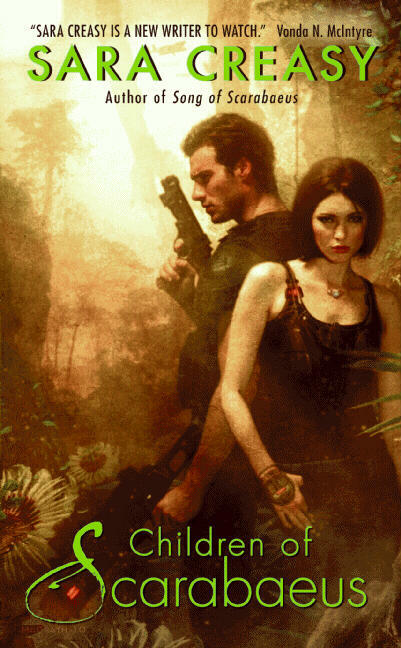 It's Finn and Edie in a jungle, and Finn has a big rifle. Yum. Thanks Tez for the heads-up. Perfect! I cannot wait for this to come out! Oooh, me like. McGrath always does a wonderful job. That's actually how I found Song of Scarabaeus. I was looking at his gallery on his website when I saw the cover and was curious about the two characters. Tiff, what a great way to discover a book. I've done the same thing. There are a couple more books on his site that have caught my eye and that I intend to track down. Hi my name is Mariachiara and I'am an italian reader who love romantic science fiction. I read in english with no problems but I would like for this genre of fiction to arrive in great numbers in Italy and translated in italian to be known to all italian readers. I have a little blog about books that is in contact with some italian editors and is trying to bring in Italy new science fiction writers.Hope to see your book in my country too.